Our flip charts are specifically designed to meet your explicit requirements. We will ensure important information, phone numbers appropriate to your business, assembly points applicable to your emergency response procedures and premise location as well as warden identification and a brief description of action to take during different developments throughout the situation. 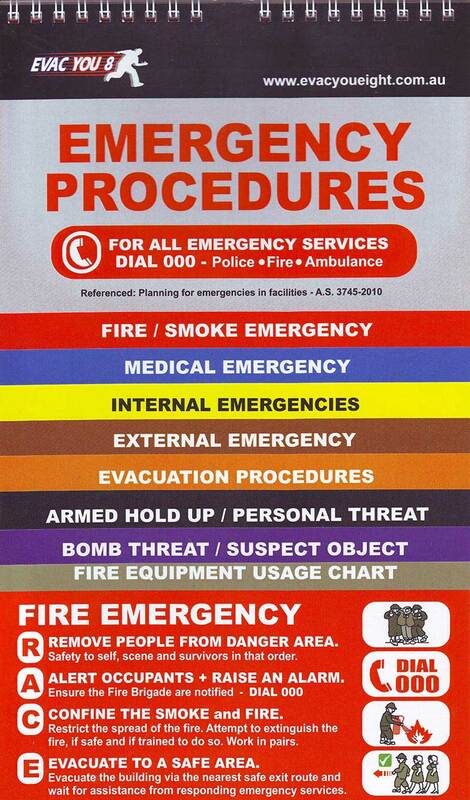 By providing an Emergency Procedure Flip Chart for your workers and ensure everyone has access to these procedures, it will assist and determine what actions are available to you in the event of an emergency such as fire, internal disaster, bomb threat or other emergency situations. We have dealings with councils, aged care facilities, multi-story office buildings, small businesses, pubs and clubs, health care facilities with numerous locations, all Flip Charts are designed with their personal branding and requirements in mind. This Emergency Procedure Flip Chart is also a great training tool when presented as a MS PowerPoint slide show!